This is a small book by local writer Brian Lawrie, with photos by Mick McKie. It is a little gem. Brian Lawrie is a real mountain man with many serious climbs and new routes to his credit. He has a life-long knowledge of our local hills, both from climbing and walking. 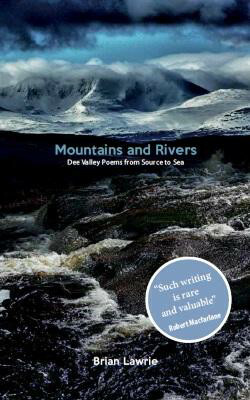 His writing comes from a deep relationship with the mountains and evokes a sense of our own impermanence and inferiority in the face of the majestic surroundings at the source and grades to a more intimate relationship as the river gets closer to the sea and the land gets quieter. The sequence as you follow the Dee downriver will resonate with us all. His stones are not mere lumps of rock or pieces of geology but real and living with a story to tell. It ends with glimpses back to the cherished mountains. His images of the "retired climber" or "getting your sticky boots out at Clachnaben", but particularly the phrase "their hopeful smear", will add extra pleasure to those of us who have climbed in the area. For walkers, we have "stalking the silent overtures of the high plateau" or "launched heroically across a granite pluton." The photographs by Mick McKie are arresting and stunningly different. None of your classic coffee table pictures here. Many are of familiar aspects, but not as you've seen them before. They are an excellent accompaniment to the poems. Finally, I finish with a quote from the well-known Robert MacFarlane on this book - "such writing is rare and valuable". With celebrity endorsement like this, can I say any more? Go out and get a copy. It is available from Waterstones, Books and Beans, Aberdeen. Yeadons of Banchory, Hilltrek of Aboyne, the bookshop in Dinnet and all the café bookshops from Finzean to Braemar. Alternatively, you can get it direct from the author at lawrie.brian@sky.com. Adam Watson's latest book documents the destruction caused by modern logging methods. There are probably worse examples in other parts of Scotland but he has restricted himself to documenting the damage caused on Deeside. As with his other recent books, this is not a book to be read from start to finish but is primarily a reference book. The damage caused by modern logging methods is wider than the simple visual mess, akin to the First World War battlefields. Not surprisingly, the battlefield landscape leads to accelerated erosion and widespread silt-laden run off, damaging the important fishing rivers further downstream. In addition to the loss of natural woodland habitat for endangered species such as red squirrels and capercaillie, the large timber machines damage the supposedly undisturbed trees, make them more liable to wind throw later and destroy the natural understory podzol soils. Once the logging has finished and the land starts to regenerate, the changed soil conditions lead to recolonization by grass, rushes and especially bracken instead of the natural heather with essential cowberry and blaeberry. In such conditions, there is nothing for capercaillie chicks and other wildlife to feed on. Colonisation by bracken is particularly concerning as the ultimate outcome will be an application for public funds to remove this menace. These issues are especially concerning when we are dealing with the few remnants of the Old Caledonian Pine Forest. These are precious and yet are just as surely destroyed by poor logging practices. It is not all doom and gloom as the author describes practices that can mitigate much of the damage or completely eliminate it. Simple practices such as using brash from felled timber can considerably reduce soil damage and low impact or smaller machines can make a big difference. Careful operation of the machines can avoid damaging nearby trees. Ultimately, in especially sensitive areas, a return to horse logging is recommended. As with all of his books, Adam Watson includes an excellent range of good photographs. They are very instructive and equip you well to make your own observations. 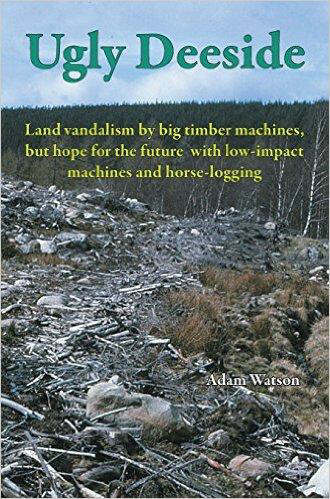 The best reason to get a copy of this book, is to better understand the issues of modern logging methods and when passing by a scene of destruction to be able to recognise whether mitigating measure were used; how bad is the soil rutting, is the natural understory is returning or being replaced by grass, rushes and bracken, etc. Measures taken to prevent silt run-off are particularly interesting as despite the same landowner often owning valuable fishing rights further downstream (can they not see further than the end of their noses? ), you will often see a complete lack of suitable precautions. Instead of looking and shrugging your shoulders, take the opportunity to really understand what you are looking at. Produced to mark the Association's fiftieth anniversary, this book describes itself as 'a jumble of reminiscences by team members'; while it is this it is so much more. Taken as a whole, it provides a history of the development of Association and the team, a series of stories, distressing and light-hearted, about rescues and bits and pieces of information which are bound to be of use to hill-goers. It is written by team members past and present, with inputs from those rescued and a SARDA dog! 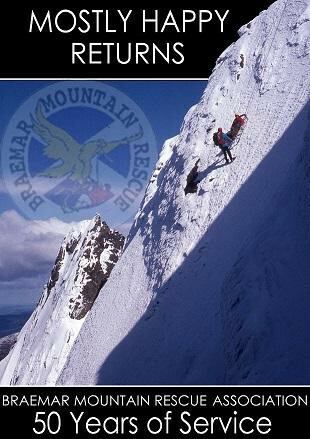 It is fascinating tracing the development of mountain rescue from the days of tweeds, rudimentary equipment, limited communications and a lack of enthusiasm for involving women to today's comprehensive training, sophisticated equipment and revolutionary positioning and communication systems. The book does not dodge the dilemmas faced by rescuers (when to retreat in the face of appalling weather) and the rescued (an interesting pieces by a man who questioned whether he should have called the emergency services). Reading the book underscores just what a risk factor the Scottish weather is, turning more minor occurrences into major incidents in a short space of time. Readers are bound to pick up useful advice. For example, how many of us are aware of the limitations of the mobile phone 999 roaming service? This gives access from the caller's phone to all networks, increasing the likelihood of a call getting though in remote areas. However, it doesn't work in reverse when the rescue services call back. The lesson is that the person in trouble should phone the rescue services again if the latter fail to phone back having said they will. There is sometimes a thin line between a memorable day and a disaster and we should be grateful to the volunteers who are ready to act, often in atrocious conditions, should we run into trouble.